Comment A new bid to break the land speed record using British technology was launched today by the Science Minister, Lord Drayson. The idea is that breaking the previous record (held by the same British team mounting this attempt) will inspire schoolchildren to embark on careers in science and engineering. 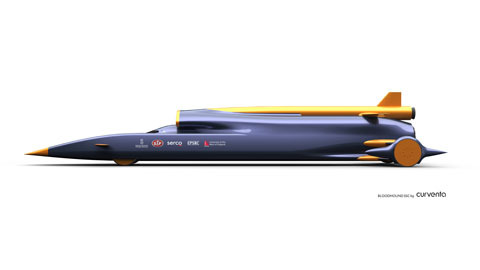 The new "Bloodhound"* supersonic car (SSC) will once again be driven by RAF pilot Andy Green, the man who took Thrust SSC through the sound barrier and into the record books in 1997. The head of the Bloodhound project, as with Thrust SSC, will be Richard Noble - the man who took the previous record for Blighty in the Thrust 2 jetcar. The latest Bloodhound SSC effort is the brainchild of Lord Drayson, who proposed the idea of a comeback tour to Noble and Green in 2007. At the time he was minister for military procurement, but he resigned last year. He said at the time that his passion for racing biofuelled cars had become so time-consuming as to be inconsistent with government office. Others have suggested more plausibly that he was angered by the Army's refusal to comply with his defence industry ideas. In any case, Drayson is now back as science minister, boosting the Bloodhound SSC scheme, which he believes will inspire young Brits to get into technology. According to Richard Noble, that was the case with the Thrust 2 and Thrust SSC efforts, and Drayson equates these with previous British engineering triumphs such as Concorde and the Lightning fighter**. “This project is not just about the bragging rights to the world land speed record," he said. That's certainly true: nobody beat Noble's 1984 speed until he came back with Green at the wheel in 1997. Blighty pretty much has the land speed record arena to itself these days, though the late Steve Fossett was said to be planning an American attempt at the time of his death. “The project’s involvement with young people is vital to inspire them about the exciting things that can be achieved by science and engineering," added Drayson. "Ultimately, I hope that this iconic British project will encourage the next generation of scientists and engineers." The BLOODHOUND Project is a private venture. Government is part-funding the three year education programme but not the build and running costs of the car. These costs will be covered by sponsorships. Except that the sponsors include the Engineering and Physical Sciences Research Council, the Ministry of Defence, the National Physical Laboratory and at least two universities. So yes, government is funding it.